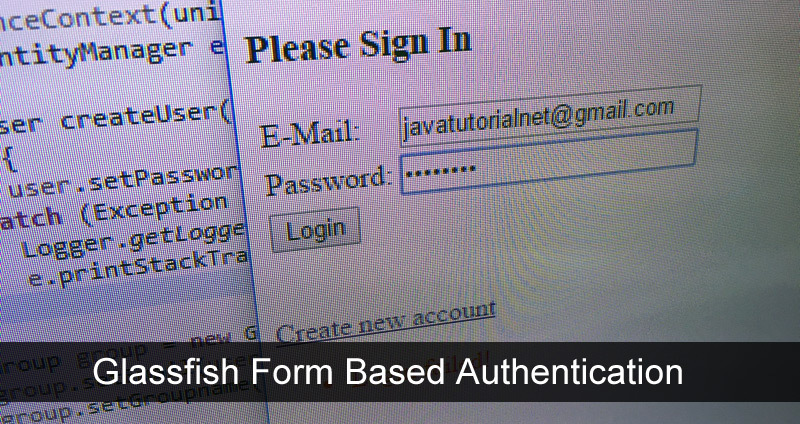 In this tutorial I will show you how to use the build-in Glassfish authentication mechanisms to create web based applications with user login. Authentication is widely used in all kind of web-apps today. From online shops, trough social media and miscellaneous service that require the user to log in. Glassfish comes with integrated authentication and authorization mechanisms to let users login and maintain session within your application. We will take advantage of this feature and build and application to allow users to sign up and sign in to access authorized content. 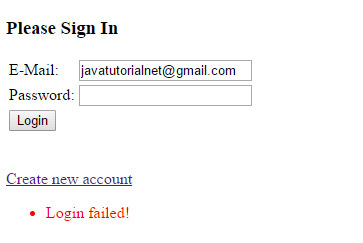 Finally I will show you how to create a logout function to allow the user to terminate the session. 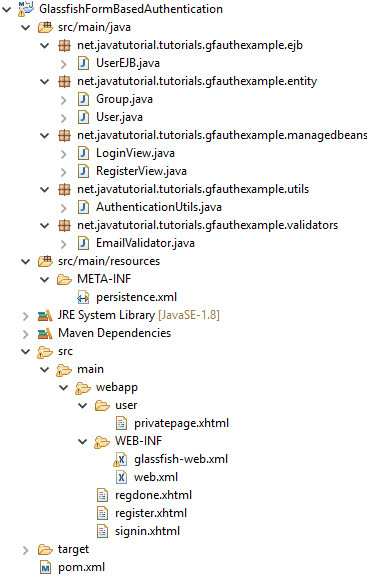 This is a full blown Java EE tutorial, which requires DB setup, Glassfish configuration, development of the the authentication back-end logic and creating the front-end part. I will use Glassfish 4, MySQL database and JSF 2.2 to build the front-end. The code will also work on Payara 4 Server and other databases (MSSQL, Oracle, etc.) without any modifications. We will create a simple web-app with one registration form, a login form and one private page. The private page will be accessible after user login. All fields in the forms will be validated against incorrect user input. 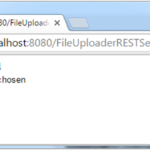 Before you continue, make sure you configured your Glassfish server with your database. 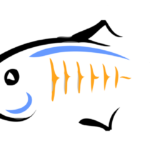 If you haven’t done this yet, read How to Configure Glassfish 4 with MySQL first. Of course you can use any other database you like to follow this tutorial. You are not limited to MySQL. groupname – to store user’s role like administrator, user, moderator, viewer etc. After you add the tables users and user_groups in your database you have to create the JPA entities for those two tables. The entities will map database tables into Java objects, so you ca easily modify or fetch the database using the getter and setter methods in your entity object. Use @Entity annotation to mark a java class as entity. The class must also implement Serializable interface. The field groupname is used to give a role to given user. This table is a mapping table with user id mapped to some role. 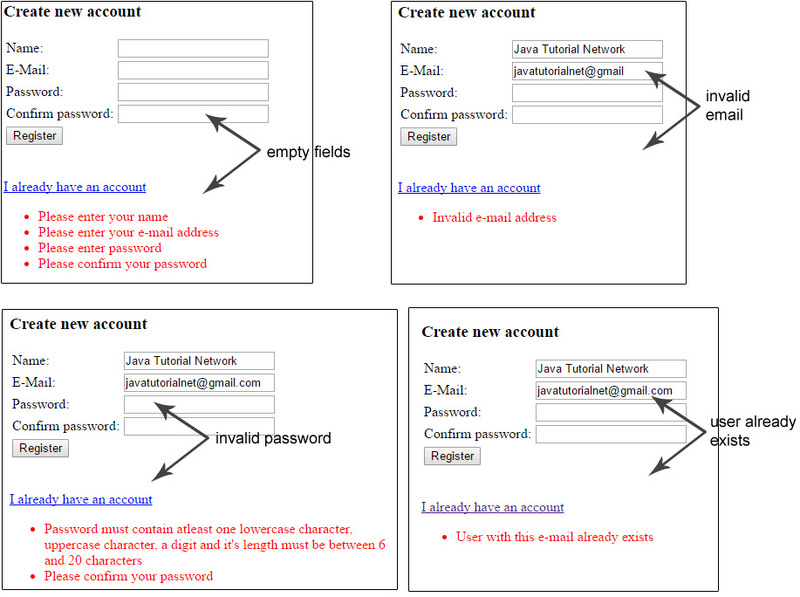 To keep this example simple, all accounts created in this tutorial will have the “users” role. You can add more roles if you need to. Roles are not predefined, you can name them as you like. The difference between the roles comes with your implementation. For example if you have “administrator” role, you will want to give it more privileges than “users”. You have to restrict the one role and give more options to the other one programatically , managing this in your own code. In this file we specify the persistence layer attributes. First we create a named persistence-unit tutorialsPU. We are going to use this persistence unit in EJBs to create isolated PersistenceContext for the EntityManager. Second, we specify which data-source we are going to use for this persistence-unit. Data sources are configured in Glassfish Admin Console (read How to Configure Glassfish 4 with MySQL for more details). Third, we list the entity classes which we want to include in the persistence unit. In our case those are the User and the Group classes, we created in previous step. 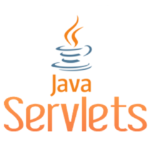 In this step we will write a Enterprise Java Bean (EJB) to insert new users in the database and query them. EJBs are often used as a mediators between the persistence layer (database entities) and the presentation layer (managed beans and JSF pages). The createUser method first encodes the plain text password into SHA-256 String, than stores both objects – User and Group to the database. findUserById method will return a User object or NULL, if the user is not found in the database. Note the usage of try-catch here. If user with given id (email) is not found the call to query.getSingleResult() will throw a NoResultException. We are going to ignore the exception and return a NULL user instead. We will handle the NULL in our Managed Bean later. 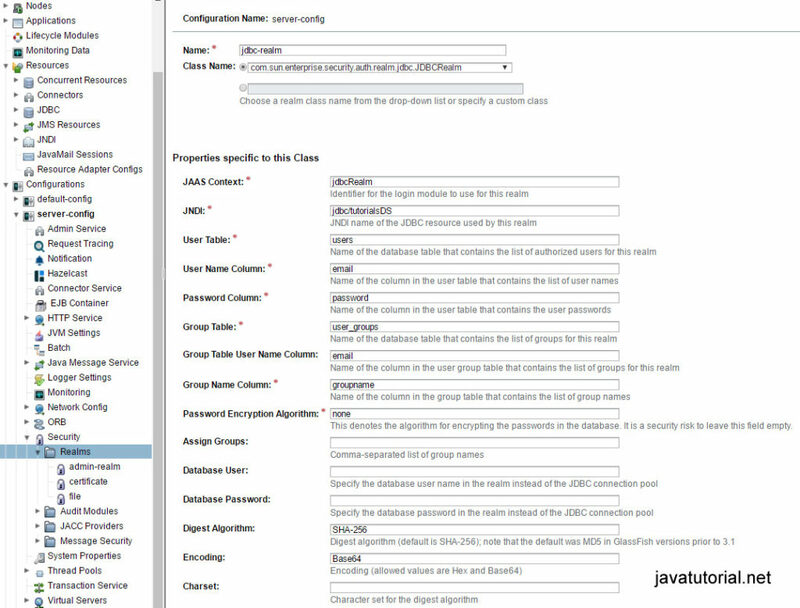 We need to create and configure a new JDBC Security Realm in Glassfish. Open Glassfish Admin Console at localhost:4848 . 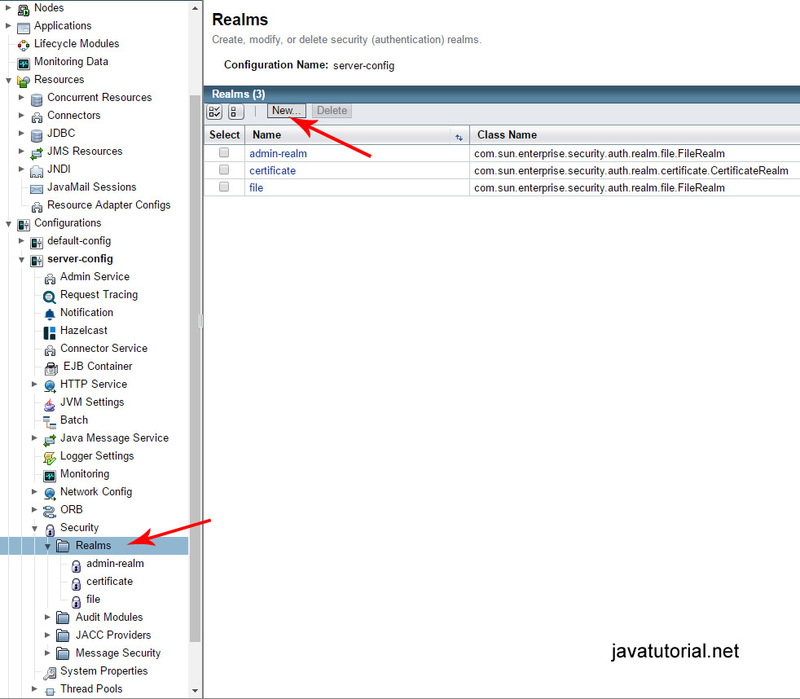 Open Configurations -> server-config -> Security -> Realms and click the “New…” button to create a new security realm. The web.xml deployment descriptor also needs some changes. We are going to configure the security rules here. First we configure session timeout. This is the time the user session is kept alive. When the session times out the user hast to login again. The value is in minutes. 300 means the user session will be active for 5 hours. Second, we set the welcome-file to be signin.xhtml. When the user opens the app the login screen will be displayed. In <security-constraints> tag we define restricted resources for specific user roles. In other words – every file in the user directory requires login to be accessed. We are going to place the private XHTML files there. 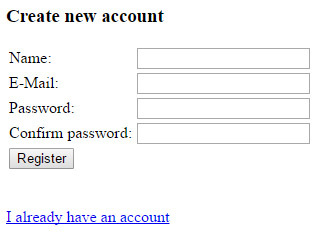 In the registration form we ask for the name of the user, e-mail address and password. We also require the user to confirm the password. We are going to validate the user input in the email, password and confirm password fields. String confirmPassword = uiInputConfirmPassword.getLocalValue() == null ? "" // Let required="true" do its job. There are 3 possible approaches to validate fields in JSF 2. I am going to demonstrate all 3. The confirm password field is validated with a system event called PostValidateEvent. private static final String EMAIL_PATTERN = "^[_A-Za-z0-9-]+(\\." If the user inputs correct data in the registration form, a new User object is created and inserted in the database. In this form we require user e-mail address and password. The form is validated against empty fields. The username and password validity is checked in the LoginView. Troubleshoot security code is very hard. Most of the components don’t throw meaningful exceptions. This is intentionally done this way to prevent hackers to get useful information while trying to crack the security of your apps. Unfortunately we don’t get this useful information either. If you find some issues try to follow the exceptions. Check your Security Realm configuration twice and check if all password encoding is done correct. Java EE authentication, ejb, entity, glassfish, jaas, java, java ee, jdbc, jpa, jsf, maven, mysql, payara, serializable, session, sha-256. permalink. yes – it is possible to build the project without Maven, although I will always recommend using a building tool like Maven or Gradle for your projects. Those do the “dirty work” for you and you do not have to handle all the dependencies, download jars, build and package. The tool does all this for you. NULL_CAUSE_MESSAGE: Cannot suppress a null exception. I am having the same problem as Gustavo. Any idea as to what is wrong?